Good morning! 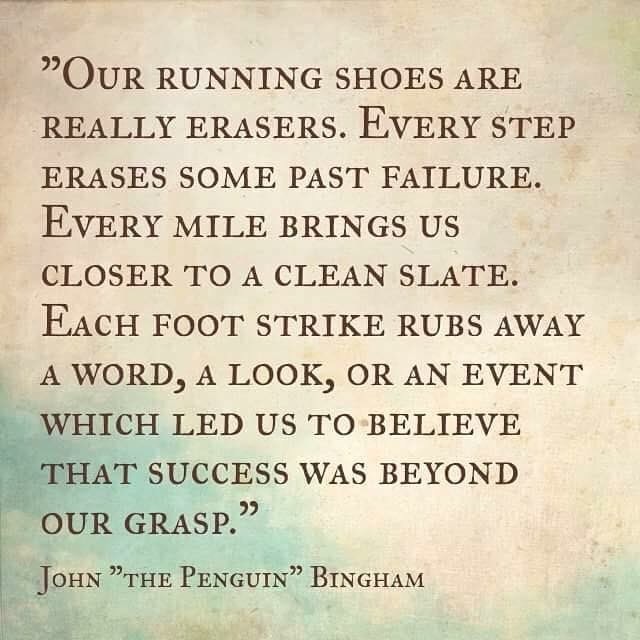 As you are lacing and gearing up for your long run this morning, I have one last thought before you head out the door. I feel awful because I saved this and I have no idea where I got it from! I just loved it! I tried doing a Google Image search and just found a bunch of The visual I get with this is so strong. I just see with each step forward erases those things that have disappointed us, caused us to second guess ourselves, and held us back from achieving so much. One of the things I love best about running! It’s through running that I get my best ideas, solve problems, and find new beginnings. When you head out today, think about all the wonderful things running does for us. It’s so much more than physical. Is it a clean slate? New insight? Does it erase failures or Ill feelings? What has it given you? Wow. I absolutely love this quote. Thanks for sharing!! It really resonates with me! Yay!! I’m glad. It did with me too. 🙂 Happy Running! Sometimes eraser, sometimes idea generator…every run gives me something! I really like this quote. So true. Running really does clear your head and gives you that sense of accomplishment that is necessary to start with a clean slate. Nice article. Will be following. Check mine out and give me a follow if you could! 78milesandcounting.. | Follow my journey from Mile 1 to Mile 78..